Arxan-Chaihe Scenic Area is in the central Greater Hinggan Mountains, Inner Mongolia autonomous region, covering an area of 13,168 square kilometers. 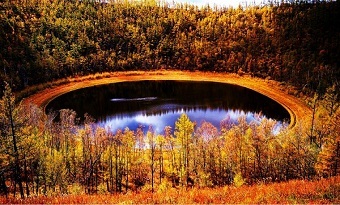 Ergune, Ergun or Erguna, in the Inner Mongolia autonomous region is named after the Ergune River, renowned as the origin of the Mongols. ​Lying near the southwestern foothills of the Greater Hinggan Mountains, Arxan or Arshaan, a regional scenic spot, features an exceptionally dense concentration of volcanic landforms. The Asihatu Hoodoos or Asihatu Stone Forest is located at the north mountain northeast of Hexigten Banner of Chifeng. Asihatu granite is a rare stone forest landform. The Xiangshawan Desert Resort in Dalad Banner, Ordos, literally translated to Whistling Dune Bay, has been recognized as China’s first desert-style resort. The Ulansuhai Nur (Wuliangsuhai) Wetland, in Urad Front Banner of Bayannuur (Bayannur), is an ideal habitat for assorted aquatic plants and birds due to its ecosystem. The desert poplar forest in Ejine (Ejin) Banner is one of the three remaining populus euphratica forest reserves in the world. Situated in northeast Inner Mongolia and named after Hulun Lake and Buir Lake, Hulunbuir Prairie or Hulun Buir Grassland is one of the world’s top 3 grasslands.